When we decided to launch OUTLIER CARTEL, we thought we’d present ourselves with a beer that showcases where we’re from: Tāmaki, a city full of ales and many tales. We at the CARTEL set out to always make Beer From Here, no matter where we would be at the moment. So we decided to make a beer that showcases all those lovely mercaptans found in the wildly growing grapefruits around this town we love. And sure enough, there are beers with grapefruit added to them (copycat? make no mistake, there’s much more out there besides the excessively sweet and almost candy-like ssculpinn’), but none would showcase the very particular flavours of our very own Poorman’s Orange, a hybrid of unknown origins but presumably a natural cross with one parent plant being introduced by Sir George Grey to Auckland in 1855 – a natural tangelo so to speak and very different from Citrus paradisi, which is what the rest of the world calls (a true) grapefruit – a tree that doesn’t like the New Zealand climate. This also makes this fruit healthier than the OG grapefruit, as it has a lot less bergamottin and lycopene. We did a number of test batches, we let some get tasted by our friends, and we decided to go ahead and make a whole lot of it. Aaaand you guessed it: this required a whole lot of grapefruit zest and juice. We made a day out of this, and did a bbq session with some of our friends the day the All Black’s became back to back rugby world champions. We’ll be posting something around the use of fruit in beers complete with photos from brewday soon. This beer would showcase some of the bergamot, tangelo and orange like aromas with a distinct grapefruit pithy bitterness – without being too bitter… We still admire balance in a good beer. We think this might become an entirely new style, we’ll call it the ‘Tāmaki Ale’. We are set to launch this on Friday the 4th of December, further details for the event will be published on our fb. 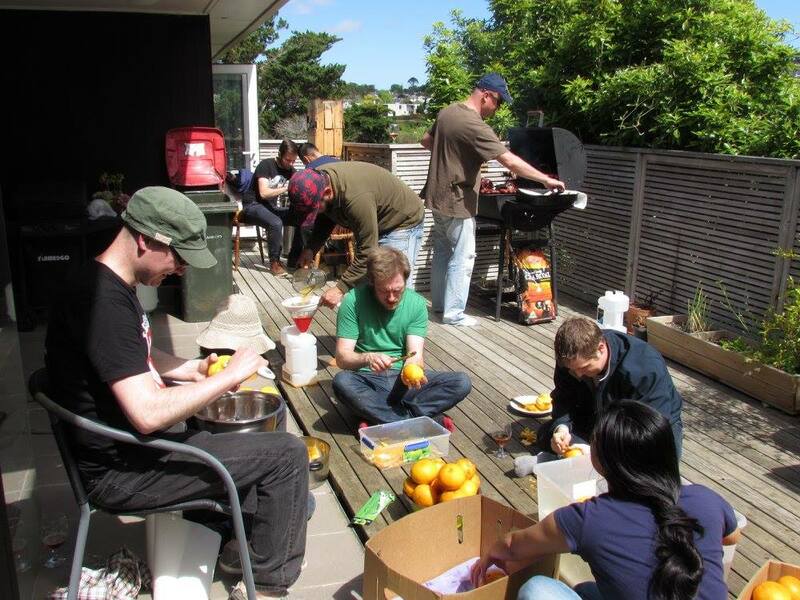 Check out some of the photos from our zesting and bbq-ing we did on Sunday. What an awesome day it was, BIG thanks to everyone that came and got their hands dirty, there’s so much love put in this beer!